Sometimes simple is the only way to go. Because we are all busy with our everyday lives and taking on just one more thing can be hard. I get it. You are busy. I am busy. We are all busy. Maybe busier than we need to be, but I’ll save that for another post. So in this post, I’m not going to get fancy. I am just going to tell it to you straight. 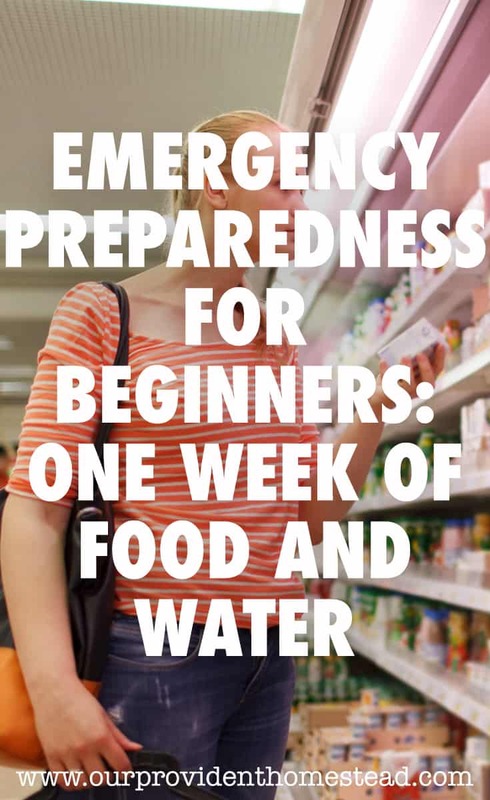 If you don’t have one week of food and water stored in your house for emergencies, you are doing your family a disservice. Why do I think this is such a big deal? Having enough food and water for your family for 1 week is the MINIMUM you can do to help your family in times of emergency. I’m not talking about months or even a year of food and water storage. 7 days is all I am asking for. You can do this, you just have to make it a priority. I’m not talking about organic, real food. I’m talking about things you can eat to survive for one week. These may not be things you eat regularly, and they don’t even have to be healthy. After all, you don’t plan on eating them for that long. They should be non perishable or atleast shelf stable for several months. Canned vegetables, meats, soups and meals. Freeze dried foods or MREs. Granola bars, beef jerky or protein bars. Ramen noodles or boxed mac and cheese. PopTarts, oatmeal packets or dry cereal. Crackers, peanut butter or tuna packets. How much food do I need for 1 week? This depends on the size of your family. You usually want to shoot for about 2000 calories a day per person, depending on the size, age and activity of the person. My teenage boys eat much more than I do. They eat several servings of a food, so I can’t go by servings alone. And I don’t want to skimp on their meals because they will probably be doing a man’s share of manual labor in an emergency situation. Whatever amount your family normally eats in a day, multiply by 7 to get an accurate amount of food. How much water do I need for 1 week? It is commonly accepted that you should store 1 gallon of water per person per day for drinking and cooking. You may want to store more if you are using it for bathing or washing dishes/clothes. You can store water in small water bottles, 7 gallon jugs or large 50 gallon barrels. Whatever you have room for in your home. 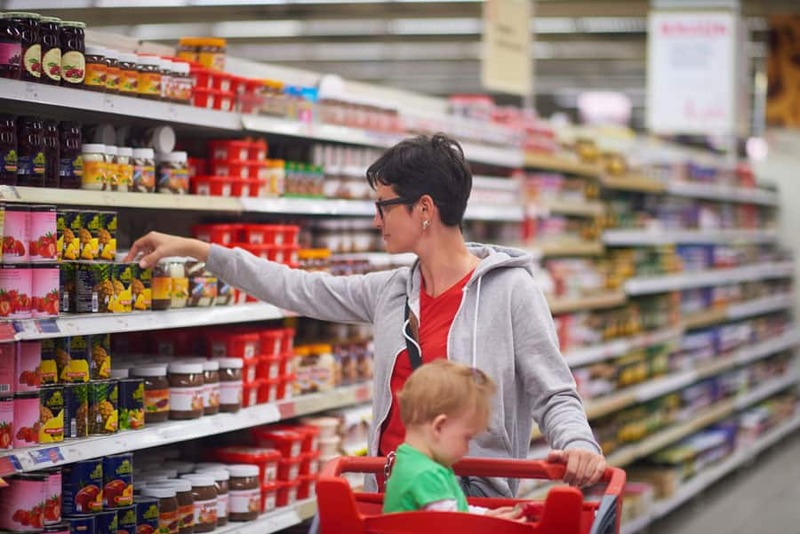 You don’t need to make a complicated meal plan for your emergency food storage. Here is an example of a simple meal plan for a full day of food. Multiply this by 7 and then by the number of people in your family. Of course, you can mix it up if you want. You may not want to eat the same thing every day for a week. But don’t over think it. The more complicated you make it, the more likely it won’t get done. Once you have your list, get to the store and get it this week! If you have a Costco or Sam’s club near you, you can get these things in bulk to save money. If not (we don’t have those things close to us either), just go to your local WalMart or grocery store and pick up what you need. Don’t wait for a sale! Get it this week! These things aren’t that expensive. 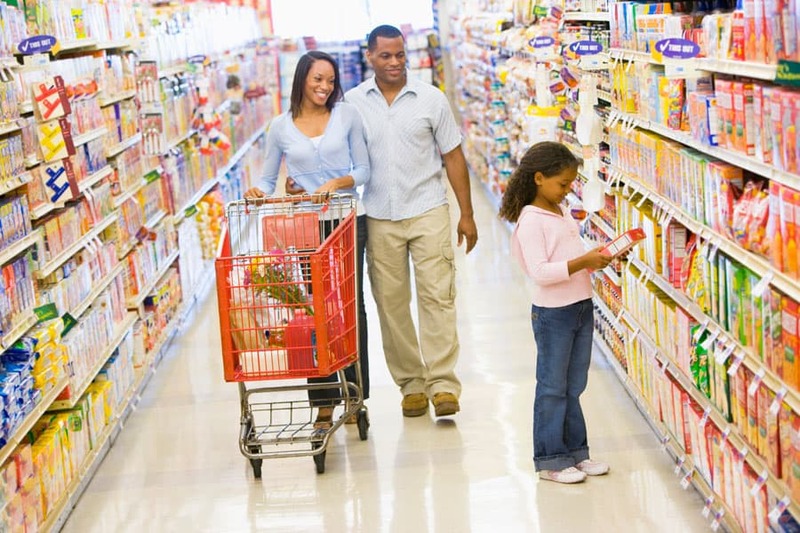 Get the store brand to save money. Once you buy and store one week of food and water in your house for emergencies, you can have peace of mind. Peace of mind that if disaster strikes you have provisions to live on. Peace of mind that if you get sick your family can fend for themselves. Peace of mind that if you lose your job you don’t have to go to the grocery store for a week. And that peace of mind can be worth its weight in gold. I promise you that. 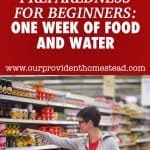 What are the steps to get one week of food and water for my family? Evaluate how much you need for your family. Make a list of the items you want to buy to fulfill your goal. Go out and buy enough food and water (or containers) for one week. Store it in a dry, easy to access place in your home (this doesn’t have to be the pantry). Rotate this food every few months to keep it fresh. This is just a drop in the bucket for emergency provisions that you could be making in your life, but it is a big, important step forward. If you would like to find out more about emergency preparedness, we have several online mini courses in our school that can help you get your family more prepared. Check out our emergency preparedness mini courses here —> Our Provident Homestead School. I want your family to be prepared for whatever lies ahead. Gathering one week of food and water is the first step. Get started today! What do you like to store in your short term food storage? Let us know in the comments below. And if you found this post helpful, please share. Thanks!